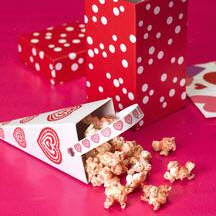 Kids of all ages will love this fun-to-eat cherry-flavored popcorn...and it is so easy to make! Put popcorn into a very large bowl and spray lightly with butter flavored oil. Sprinkle with gelatin. Bake in 350°F (175°C) oven for five minutes. Gelatin will dissolve slightly and stick to the popcorn.